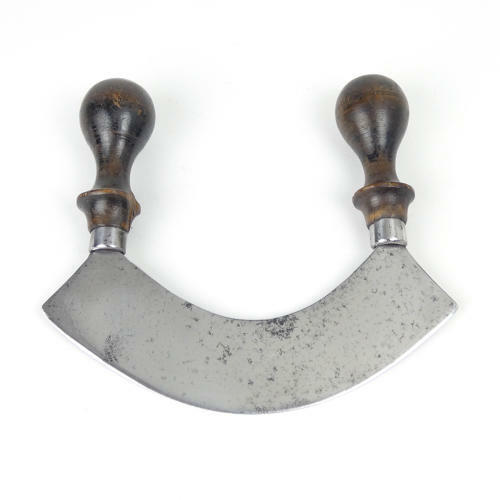 A small, twin handled, herb of vegetable chopper. This piece has an engraved mark on the blade which consists of the letters 'W' and possibly an 'O' with a crown shape. The O is not totally legible as there is slight pitting to the steel over that part of the mark. It dates from c.1880. This is quite a small size for a chopper of this type. There is slight damage to one of the turned wooden handles but other than tat it is in good condition. The blade is still very sharp so it could be used.